Clear Computer is providing our ‘silver surfers’ with information and products to make using technology less difficult. Over the past years Clear Computing has become heavily involved in introducing IT to the elderly, whether those living at home or those participating in the government scheme ‘Get Connected’. This enabled eligible residential and nursing homes to receive up to £20,000 to spend on desktops, laptops, projectors, screens, digital cameras, broadband as well as computer furniture and accessories. This has had an amazing effect on Silver Surfers being able to communicate with the outside world, particularly with their loved ones through email and skype. Whether you or your ‘silver surfers’ suffer from limited sight or you find using a mouse problematic, Clear Computing can make using your PC or Laptop effortless. Why not try our FREE download of features found on your own PC that may help to make using a PC/Laptop more accessible for you or your silver surfers. 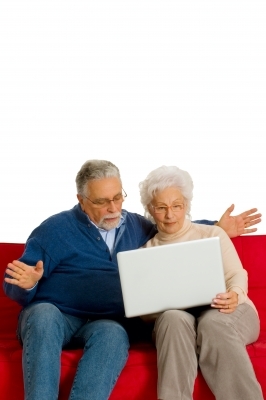 Clear Computing’s products are specially designed for the elderly to assist them in using a PC or Laptop. Take a look at our product range. Computer Desk: As we understand that sometimes accessibility is restricted for silver surfers, we can provide desks that are adjustable and adaptable to the user. Posture/Seating: We have experienced that some of our silver surfers suffer from aches and pains and when using a computer it can emphasize the discomfit experienced. By providing support some of the aches and pains that come with using a PC or Laptop can be eased. Monitors: Our monitors can be touchscreen, meaning that the use of a keyboard or mouse is not required. We can also supply larger screens and handheld devices. Contact us today for any advice you may need.